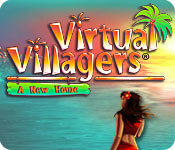 Virtual Villagers 1: A New Home Walkthrough will help you build the poor villagers a new life with custom screenshots, hints, and cheats for every moment of the game. They need to become farmers, builders, scientists, parents and more in order to thrive on this new island. How will you lead your tribe? Successfully, with this Virtual Villagers Walkthrough at your side. The berry supply is limited and you’ll need to find another food source as soon as possible. Nursing mothers devote all of their time to caring for their baby and don’t do any productive work in the village for 2 years of game time. Babies eat as much as adults and making too many babies too soon can quickly create a food crisis. Any villager (even a sick one) can heal another villager, but healing is only possible when a villager’s status is “Sick” (check the Details screen). Sometimes a villager will "resist" healing attempts by a specific doctor. If that happens, try to heal your sick villager again with a different villager. Sick villagers need to be healed or they will weaken and die [*] Villagers can become weakened by such things as prolonged disease, starvation, on-the-job injuries, animal attacks, or old age. Villagers who show a status of "Weakened" will generally improve in health over time unless they are sick, elderly or continue to suffer injuries. The villagers need to be taught to perform a job – they will not initiate tasks in an occupation in which they have no skill. You can view information about various technology advancements on the Village Tech screen by clicking on the “?” button for that technology. This information will help you choose the order in which to purchase new technology. The villagers’ curiosity is often a clue to puzzles. The children can find and harvest a certain kind of food. Picking up a villager while they’re working will interrupt them, and they will drop the object that they were carrying. Most of the puzzles are dependent upon some combination of Village Tech, villager skills, and other puzzles. Although some puzzles depend upon the completion of specific puzzles, the 16 puzzles are rarely completed in the order that you see them on the puzzle screen. Pay attention to the things that your villagers are curious about and the messages that you see when you take one of your villagers “exploring” around the island. These often provide clues that will help you solve the puzzles. Another good strategy is to drag one of your adult villagers around the island after every tech purchase and look for new things that they can work on. Most of the frustration related to solving the puzzles is brought on by impatience. It takes time for your villagers to gain the necessary skills and technology to work through all of the puzzles. Each puzzle is referred to by number. The puzzles are counted sequentially, with 1 being the leftmost puzzle in the top row, and 16 being the rightmost puzzle in the bottom row. Get a builder to clean the well. This is the village water supply. Get a villager with building skill, drag them to the well and let them fix it. Build a new hut. Population is maxed out at 7 until you build a new hut. A villager trained in building is required to build new huts. Clean up the beach debris. You need to clean up the debris so the villagers can fish. Drag a villager to the debris and it will start cleaning. Starting a village school. You need a master scientist. Drag them to the long building north of the reasearch table to start a school. Remove the blockage of the creek in the northwest corner of the village. Villagers need level 2 in construction to work on this. Drag a villager to the rock pile blocking the water flow from the creek. When the blockage is cleared, water will flow to the lagoon. This puzzle is the key to solving three more puzzles. You need to complete puzzle #5 first and have a villager with level 3 harvesting. Take a master farmer to the lagoon and they will start hunting fish. This may take awhile. Discover the graveyard (requires Level 2 of Spirituality). When a villagers dies, drag an adult villager to the northeast corner of the island. The villagers will provide a proper burial the pile of bones in village center. After this first burial, villagers will automatically have burial ceremonies for any deceased villager. Discover the medicinal properties of 4 plants. One plant is the cactus near the boulder, one plant is near the lagoon, two are on the east side of the island. Drag a villager to each plant until all four are mastered. You need to complete puzzle #5 first. Drag a villager to the field on the east side of the island (where the dead flowers are). They will water the field with water from the lagoon. Make sure to use a villager with building skill so that the watering continues until the flowers bloom. Solve puzzle #14 first. Wait for the butterflies to follow the golden child, then drag the golden child to the strange plant north of the berry bush where the butterflies will pollinate the plant. Restore the temple at the ruins (requires Level 3 of Construction). Drag a villager to the ruins in the southeast of the island and they will begin restoring the ruins. Requires puzzle #11 complete and Level 3 Spirituality. Drag a builder to the shiny rock on the west side of the village and they will chisel the rock to create an idol. The birth of the golden child (requires Level 3 of Fertility) . This requires puzzle #5, puzzle #12. Drag a nursing mom to the lagoon. Requires puzzle #13. Drag the golden child to the magic flower garden and wait for the butterflies. Buried treasure (requires Level 3 of Construction and Level 3 of Science). Search the sandy areas on the south part of the island between the food bin and the temple. Moving the boulder (requires the golden child). This one just happens on its own when the golden child is ready, you can't force it. Is there a limit in the population size? The population limit is around 90 villagers. I always run out of berries before i can get enough tech points to increase my harvest level? Try to put more people at the research table. Also you don't need to always have someone at the berry bush. If there's enough food in your bin (like 150 or so ... even 100 is good for early on in the game), allow that farmer to do some research. Then once your food dips below a certain point, put that farmer back on the berry bush. Remember also that children can spot mushrooms around the village and help increase the food level. At what age can kids start working and breeding? Working at 14 and breeding at 18. How do you build new huts? Just drag a villager on the construction site (foundations) and he will start constructing. It may take a few tries to get the villager started. How do I know where to start construction? Drag the villagers around (hold the villager and don't let go) and they will tell you what they see. How do you accumulate tech points ? Drag a villager to the research table (center of the village) and they will initiate research and start gaining points. You can also check the preferred skill box for research so that they prefer that activity over the others! Children can spot mushrooms around the village. But act quickly, because mushrooms wilt rapidly in the sun. How is Virtual Villagers different from Village Sim? Virtual Villagers is basically the desktop version of Village Sim. Since Virtual Villagers was developed after Village Sim, it has some additional features like: 4 addtional puzzles, naming of villagers, more island events, likes and dislikes of villagers, mushroom hunt for children, new original music.